Market share – What is Palm’s share of the active installed base? How does this compare to HP’s share? Is Palm stronger in some countries than others? 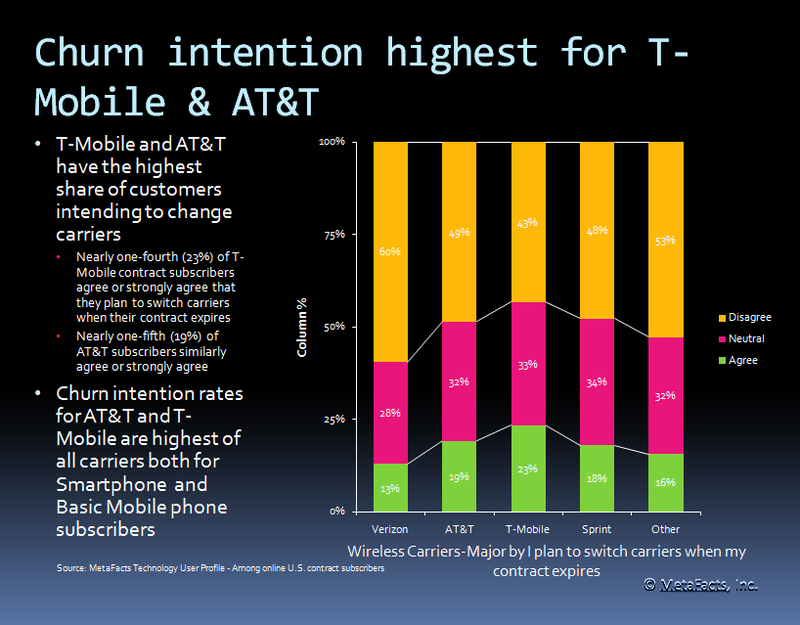 How is this different than Apple’s or RIM’s share? Usage profile – What activities do Palm users do which sets them apart from users of RIM, Apple, and other mobile phones? Are Palm handhelds more alive than the rumors about most being ancient Palm Pilots and more like PDAs than smartphones? To what extent are Palms used like a phone or communication tool than other handhelds or mobile phones? Are many used like a feature phone? How does this compare to usage of RIM’s Blackberry or Apple’s iPhone? How about with the devices of other makers including Motorola, Nokia, Sony, Samsung, or LG? Freshness – Are Palm mobiles older or newer than other mobile phones? User profile – Are Palm users primarily older PC veterans or has Palm won younger newbies? Is there any gender difference? This TUPdate condenses the results of 46,799 user surveys into brief, solid facts, with more than 10 pages of tables and brief analysis. Current subscribers of the Technology User Profile Global Insights Edition may obtain this information directly from MetaFacts, as well as additional customized drilling down into the full dataset. The countries covered include: United States, Mexico, Brazil, UK, Germany, France, Italy, Spain, Netherlands, Russia, China, Japan, South Korea, India, Australia, and Saudi Arabia. To order these results online, contact MetaFacts. When you’re number one at home, it’s a lot less fun to go abroad and be number three, four, or lower. Google, Yahoo, and Microsoft’s search sites have that unenviable position in China today. Customer vote with their fingertips, as much as they can. Engineering-oriented American technology companies have a tough enough time trying to use innovation to grow, yet it takes much more than exporting technology to attract the same market share or type of customers. Based on surveys of Chinese urbanites as part of the Technology User Profile 2009 Global Insights Edition, MetaFacts finds that Google, Yahoo, and Microsoft’s MSN, Live, and Bing are ranked 3rd, 4th, and 5th as the preferred search engine. Each of these engines which dominate in the US have 5% or less share in China. The top two preferred search engines are Baidu with 68% and Sogou with 23%. Furthermore, the few regulars which the American search engines have attracted are less active and demographically less desirable than those using dominant Chinese search engines. Sogou, perhaps taking a page from the “we’re number two and we try harder” approach, have attracted searchers with the most interesting qualities for marketers. Sogou’s households are larger with nearly four persons on average to Google’s and Yahoo’s four. Sogou’s searchers are more sophisticated using mobile phones, with 61% regularly using their mobile phones for 11 or more activities, while Google’s and Microsoft’s customers are more likely to be basic mobile phone users. Sogou’s searchers also both have and plan to have the longest list of consumer electronics, from entertainment to imaging. Taking the long view, perhaps American search engines’ foray into China might be seen as the first steps of a long journey. MetaFacts Technology User Profile – 2009 Global Insights Edition – a syndicated survey of 30,889 representative respondents in 16 countries. The Motorola-Verizon-Google collaboration may be a solid contender to Apple’s iPhone, yet is starting from far behind. At least that’s what over 20,500 mobile phone subscribers in 10 countries had to say about it by how they’re using mobile phones today. MetaFacts surveyed these respondents as part of its Technology User Profile 2009 Global Insights Edition. First, MetaFacts classifies SmartPhones differently than most research firms – based on how actual users end up actually using their mobile phones. We believe customers vote with their fingers, and are the final and best judge of what a smartphone is, and what a basic mobile phone is. Basic phone users should be admired for their bob-ness. In tech lingo, BOB means Best Of Breed, which is about those who prefer to use the best tool for the job versus the all-in-one Swiss army knife approach. The simplest mobile phone users use their mobile phone for less than three activities on average, with only one activity reaching half of this group: making a phone call. At the other end of the spectrum, the smartest mobile phone subscribers busily juggle over 13 activities on average and with 15 activities done by over half of this handy group. We compared the share of mobile phone users who use their phones with the smartest breadth of activities versus those who are the simplest. We found the U.S. carriers with the richest ratio of the smartest to basic users are with MetroPCS, Sprint Nextel, and AT&T. Although these carriers have lower overall shares than Verizon, they have savvier subscribers in how their use their handsets. We similarly looked at the brands of mobile phones in current use across 10 countries. Of the top 12 mobile phone brands, Motorola ranked last, edging out Sanyo, while Apple ranked first, followed by RIM, HTC, Palm, and Sony. The findings are similar in the U.S., although with the top five in a slightly different rank order. Whether in the U.S. or in any of the other nine countries we surveyed, Motorola and Sanyo have whole new types of customers to reach. We also looked at survey respondents to see Motorola’s share among those who use Google to search the most, and found that Motorola has a slightly higher share among those who use Yahoo, MSN, Bing/Live Search, or Wikipedia. Enthusiastic engineers, marketers and perhaps investors will see this half-empty glass as room for tremendous growth. Their speed of market success will depend less on the technology itself and more about how soon mobile phone users change what they do. ‘Coopetition’ and ‘frenemy’ are clumsy words to describe the relationship such as that between Microsoft and PC makers. Depending on your role in the industry, you might choose one of the terms from biology such as commensal, mutualist, or parasitic. Whichever term you use, the reality is that during major changes such as a new operating system release, to avoid wholesale market confusion and bringing buying to a standstill, there is a great interdependence between Microsoft and PC makers. As Microsoft launched Windows Vista, PC makers made various choices about how aggressively they were willing to tout the newest operating system and negotiate the best position, all while still keeping buyer’s interest strong. Market adoption is never an overnight event, and with a large installed base, adoption takes even longer. During this particular transition, early anecdotal reports of incompatibility and incomplete support and drivers added to delayed adoption by many market segments. Consequently, some PC makers continued to emphasize Windows XP and offer it longer than other makers. Dell, in particular, offered XP well after the release of Vista, and their installed base reflects that. The majority (83%) of Dell mobile PCs are running Windows XP. 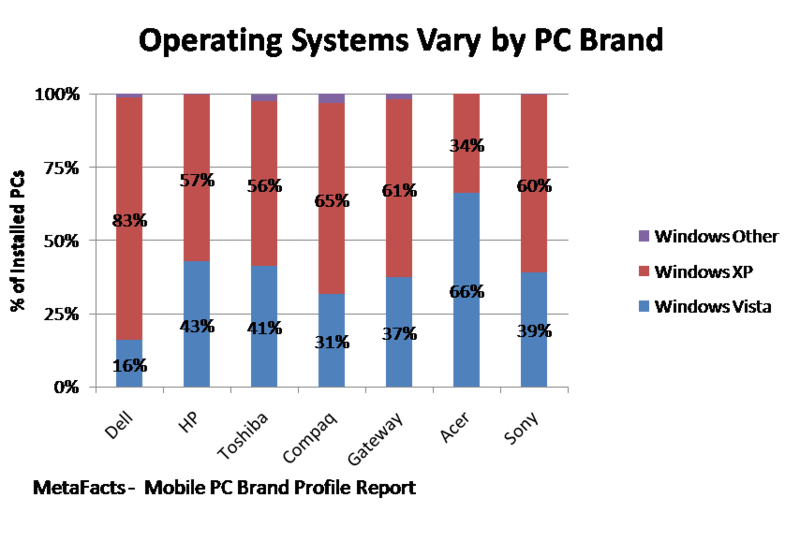 By stark comparison, Vista is on closer to 40% of mobile PCs from HP, Toshiba, and Sony.